Earn $5.71 in VIP credit (571 points)What's This? The Acepac Zip Frame Bag features PU-coated Ecomade Cordura Ripstop fabric with YKK zippers, zip garages, Duraflex couplers, and Hypalon drawcords. 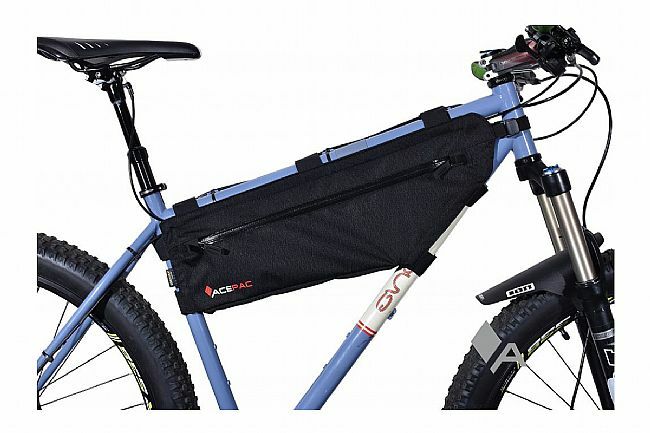 Seven hook-and-loop straps and one camlock buckle strap for the top tube ensure stable mounting inside the frame. Padded foam inserts help the bag maintain its slender, triangle shape. The seams are reinforced with Bartack stitching and the thread itself is Polyester with a high fiber diameter for lasting durability. You can even carry a water reservoir inside the bag and thread a hydration hose through the designated slot as a super efficient hydration option. PU coating keeps gear dry in light showers. Access from both sides with two waterproof YKK zippers. 7 hook and loop straps, plus one Camlock buckle strap. Dimensions: 15.75 x 2.36 x 6.69 inches.